I'd been meaning to put this up. My wife and I have been following the show Last Comic Standing, and one of the guys on there did a routine about Splash Mountain. He did the normal flip off the camera, ruin the picture, "nothing ever happened" everyone else in the log pissed at him because now they can't get their picture (actual routine was hysterical because it was dead on!). That got me thinking. I know everyone has their crazy traditions, and I was wondering if anyone has a certain pose that they do on Splash? For those who don't just want the standard shocked screaming look... Also if anyone has any funny pics! In WDW, I used to, when I was in the front row of the log, drape my arm over the front of the log, put my head down to the side. It looked like I had passed out sleeping. I used to do that for every picture when I was in front, until receently when those pictures started disppearing more and more frequently. Now I need to think of a new pose, because everyone always loved the sleeping pose, but I feel bad whenever the picture is washed away, so I don't do it anymore. I do stupid poses on Buzz Lightyear. I don't ride Splash ('fraid of heights and 'fraid of Disney water. I think the last time I road Splash was over 2 years ago), and usually my pose is "I think I peed my pants" because I am so scared of that ride. Buzz, I like to see what gets passed through when playing with the gun. Certain stuff I think "okay that's tame." Suddenly lost in space, but then I do other stuff that's not tame and Kurt Cobain-esque gets through... it's weird. I only once did a pose on Splash Mountain and that was ten years ago at my school's 8th grade trip. I convinced my friends to stick their tongue out to the camera when we went down the fall. It went off perfectly except for one stupid girl who forgot because she was too afraid. :bang::bash: I know my oldest brother once did a "bored" look on Splash when he went on with friends. Everyone in his log had their head on one of their hands. It was pretty funny actually. It would be pretty cool to have four people go on Splash and do the YMCA. But I think they'd have to be seperated by an empty space in order to make it work. I try to do crazy poses on Splash. It usually results in me screaming and it's usually my arms and hands that are the ones in the silly pose. The drop will always and forever freak me out to the point that I cannot make faces other than me just screaming. However, on Space Mountain.. I've done many silly poses. My favorite one that got a lot of comments from strangers that were in the ride with us was when my boyfriend and I pretended to be sleeping on the ride. 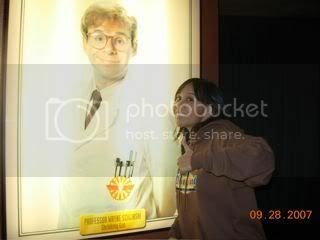 I'll have to look for that pic and post it..
DISNEYLAND: It even makes science geeks look cool!! The whole family gets in on this! We all put a finger over our lips, and puff our cheeks out like we are about to toss our cookies. We do it on all the rides. Maturity runs in our genes! The Ugly Face....gets 'em everytime. The best part is when the other people on our log see the picture. "I Want That Simple Life"
My husband loves coming up with new poses. Once he lifted his shirt over his head so he looked "headless." Others include talking on his cellphone, and picking his nose, to name a few. Now my 8 yr old son is getting in on the act. Being an 8 yr old boy, he loves the "I'm picking my nose" routine. NICCCCE! I remember seeing this website with pictures of a guy who would ride the rim runner in Adventuredome (i think) over and over with the same unimpressed look on his face. My husband, 4 brothers and Dad all rode in a log together in matching navy blue hoodies. They all put their hoods on and crouched down like they were in a bobsled. It was hillarious!!! I'll have to find a picture and post it!! Mom and I were waiting outside to take pictures/video. It was so funny to hear everyone around us say "Did you see that?!!" "What was that?!" hehehe!!! Last week on Space my sister and I pulled out our park maps and looked like we were reading them. It was really funny, but my sister's map was upside down! There's a picture someone out there probably has it because I heard people giggling about it, right when Space Mtn first re-opened. The comet area where they take your picture at the end, I wasn't expecting that. It creeped me out, didn't know what was going on, so I am grabbing at something looking totally out of it. I usually don't pose, I just put my hands up and enjoy the drop. I have only been on it once and I didn't try to make a stupid pose but it sure came out pretty stupid. Now, I'll turn that little mouse's dream into a nightmare Fantasmic! Not technically a "pose," but I will often do Goofy's signature "Ya-hoo-hoo-hoo-hooey" yell as we go over the drop. I have also been known to give an overexaggerated grin and big thumbs up to ride cameras. My brother and i always do the same thing for most cameras , interestingly enough , we call it "BEING GRIMM"
:lmao: That little boy behind you guys looks like he's going to punch you! I have to find some pics, but I like to look bored and look at my watch on rides, and once I had my Pal Mickey with me on TOT and I covered his eyes with his hands and clipped him to my shirt while I did the same, and that actually came out pretty cute! If I don't make a pose, I usually scream like a psycho on rides, and I'll have anyone with me crackin' up. I'll be the one with a high pitched screech throughout the whole thing! That's hysterical - and I have a picture from TOT with a guy making an overexaggerated grin and thumbs up to the camera - maybe it's you! I love posing for ride photos! It's so much fun. The whole family does it. Bunny ears on the person in front of you--now, that is really difficult to do on the Splash Mountain drop. My family has attempted to pull this off multiple times, typically with very amusing results. As you drop, your instinct is to grab on to something, even the person in front of you--not float one of your hands above their head. Everyone ends up looking scared yet happy, with our hands doing the oddest things above people's heads. My sister and I rode Space Mountain together and tried to do the same thing for the photo, holding bunny ears behind each other's heads. Not having been on the ride too many times, we weren't sure exactly when the exit tunnel would be, so we spent about the last third of the ride with our arms sandwiched against the seats and our hands flailing around above each other's heads. It was great. My cousins know someone who rode Screamin' while holding a chessboard with pieces glued to it. When the picture was taken, this person appeared to be contemplating their next move. I wish I'd seen that. Of course, when you first ride a ride, you don't want to pose, since you don't know where the photo is taken, and you want to see your genuine reaction. But once you've been on something a few times, it's fun to challenge your instincts and attempt to do something your body doesn't want to do. If I can, I'll post some pictures at some point. Not technically a "pose," but I will often do Goofy's signature "Ya-hoo-hoo-hoo-hooey" yell as we go over the drop. That reminds me--off-topic, but I tend to do a strange, ululating yell as we go through that long, tight clockwise turn in Thunder Mountain. It's somewhat involuntary. Go figure.